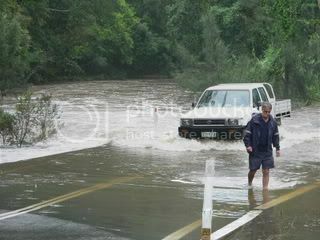 The big 4WD vehicles could do it but no cars were willing! The water looked really menacing close up, and it was pretty loud. 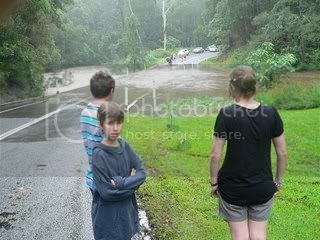 Upriver was particularly swollen looking, and we just didn't want to ruin our holiday being washed down the creek LOL! So we went back the other way. You were probably wise! 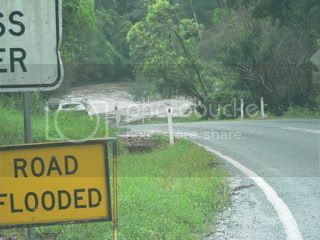 We used to have a lot of those crossings in England - known as fords - sometimes paved and sometimes not... As you can imagine, they were often quite deep and people got into a lot of difficulties! I think they've all been bridged now - pity, in a way, as some of them were very pretty in old villages! There was always a warning and then a sign afterwards telling you to try your brakes. -There was always a warning and then a sign afterwards telling you to try your brakes. Well, that's all very well if you make it across!! Here we would always have a bridge or a big fat pipe under the road. It does look pretty damp!!! - don't blame you for turning back... definitely an only if your journey is strictly necessary sort of situation! Yeah, it was damp. And it looked like there would have been more fords ahead. We didn't want to get trapped between two! We're not that pioneering. Not in a rental car! I always wanted someone to make me some damper! I've never made it myself, but when we were camping once the guy who ran the camping ground used to make it every night for the campers, it was quite delicious. You can get damper rolls in the supermarket now, it's not quite the same but they are nice and some places serve it with meals rather than plain bread rolls. I imagine it'd be like making griddle scones, and I've done plenty of those. Damper in the supermarket just doesn't sound right, huh! It'd be like us buying huhu grubs at the deli.